A lot of my ideas for cooking come from visual cues. I “see” ingredients rather than first “tasting” them, although I think the trigger to see them is the result of some sort of gustatory memory. I think of pretty much everything in visual terms, including sound. So, and without delving too deeply into the cognitive basis for my menu planning, I started to see some alternative ingredients in response to the other week’s orange custard tart mishap. Figs, or possibly prunes, but finally I saw the little seeds and figs it was. I also timidly saw rosemary, although I wasn’t sure how to incorporate it til reading a recipe on the Mélanger blog that detailed instructions for making rosemary infused crème brûlée. Once I’ve seen some ingredients I generally check in cookbooks or on the web for recipes that contain the ingredients and either use the recipes without modification or merely as pointers. I assume this is how most people approach cooking. The custard for the original tart came from a recipe for Portugese custard tarts on the BBC’s website. For the second iteration of the tart I cut the amount of sugar to just under 4 oz as I found the original too sugary. And the baking time was vastly increased to account for the fact that I was making one big tart as opposed to 12 small ones. The tart cooked for around 35 minutes. 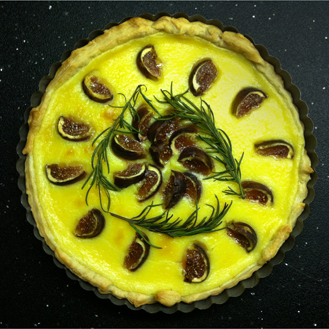 I cut the figs into eighths and arranged them in a concentric pattern on the surface of the custard once the tart had been in the oven for 10-15 minutes (eg, once the custard has started to solidify a bit). Prior to ladling the custard into the puff pastry filling I toasted some pinenuts and laid them on top of the puff pastry shell; the figs were on top and the pinenuts on the bottom. 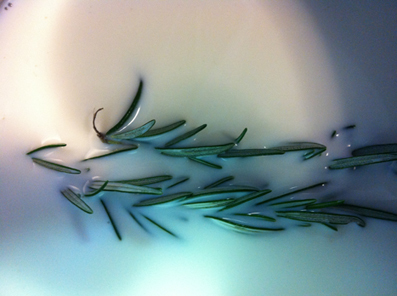 Finally when the tart was nearly cooked (after about 25 minutes) I took the leftover sprigs of rosemary that I’d infused in the milk and arranged them in a circular pattern on a non-figged area of the tart. I’ve learned alot about cooking from reading other people’s blogs and its strikes me that there’s a spirit of culinary generosity that mimics that of the Open Source (software) community. I think we’re in the midst of a web-driven culinary renaissance, fueled greatly by the efficacy of search engines. Yes you can look at Jamie Oliver’s site (which I like) or read and watch Bitten (kind of like) but you can also find a ton of content from people who are doing what they love, sharing it, and making a strong community. I see less of this in the art world . . .